Fujiyoshida History Museum (富士吉田歴史博物館) is located on Fujiyoshida, Yamanashi. 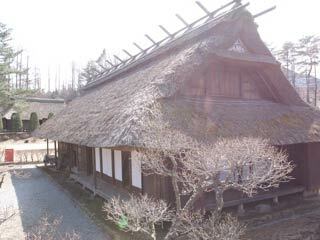 There are traditional houses which remains since early Edo Period. You can see the life style around Mt. Fuji for couple hundreds years ago. 1. use local bus to Fujiyoshidarekishihakubutsukan. This is located on Old-Kamakura Road. There are two traditional houses removed here from around the road. ...was located on Shimo-Yoshida. It was originally built in early Edo Period. It uses Kabuto zukuri Style which gives large space under the roof. People live here made silk on the roof room and use it for Kimono.